Game 1: Hungry Hippo! Up to four players. We all know game Hungry Hungry Hippo. In this game you're the Hippo!! Each player is attached to a bungee and works to the middle to collect as many balls as possible. The player that collects the most WINS!! Game 2: Lights Out! Up to four players. 2 teams of 2. A set of lights randomly illuminates in front of each player. The player must touch the light to turn it off and score a point. Doing this while attached via bungee to your opponent pulling the opposite direction. The team with the most points wins. Game 3: Tug and Dunk! Up to four players. Two players are attached to each other at opposite ends of a bungee. They pull against each other and attempt to dunk thier basket ball. The player with the most baskets wins. We run a licensed, fully-insured, and family-operated veteran-owned business. We use lead-free and USA-sourced materials for our bounce houses. Our clients get the best in customer service. 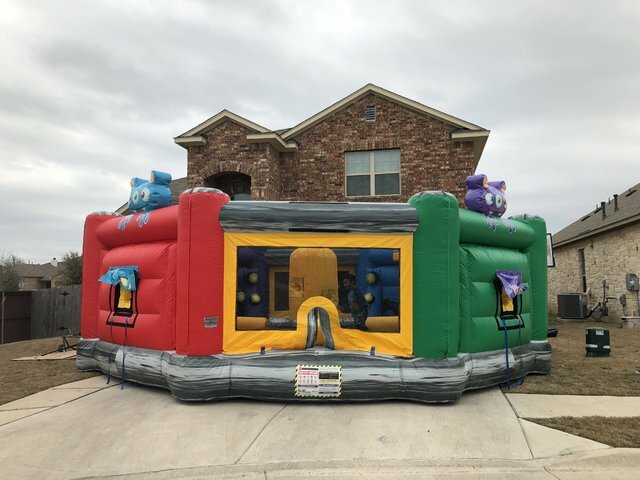 Additionally, we clean and sanitize every bounce house rental at the end of its every job. You will see how much care and effort we put into our products at the end of your event too! We operate with safety and standardized compliance in mind. You can trust in us to ensure a proper rental. We have done business for years and our customer satisfaction is a top priority. Don't click past quality, call us and rely on us to make your party a success. We can deliver the Galaxy Game rental to Austin TX and any of the following locations: Pflugerville, Cedar Park, Round Rock, Leander, Bastrop, Buda, Hutto, Wimberly, and Georgetown. We are based in Pflugerville and can accommodate for residential parties, church events, festivals, corporate special events, and more. Please feel free to send us a helpful e-mail so that we can get to know each other and talk about the rentals you are selecting. We will get back to you as soon as we can, and work out the details for your event. Alternatively, if you want to talk sales with us on the phone, please call (512) 783-4643. Browse the products below and click the image (or title) for more info. Finally, please call us to make a reservation. We can also get in touch by chatting over Facebook.